"Lately my anxiety has been coming back again in full force. It seems like the closer we get towards delivery day the more worried I get. This past week I was super on edge and wound up." So I decided to come up with some positive affirmations for pregnancy after loss. I hope they help you in times of anxiety as much as they have helped me. Click here to read this weeks Knocked Up Blogger Post to see more of the affirmations. I will also be sharing these positive affirmations for pregnancy after loss on my Facebook page for the rest of this month. 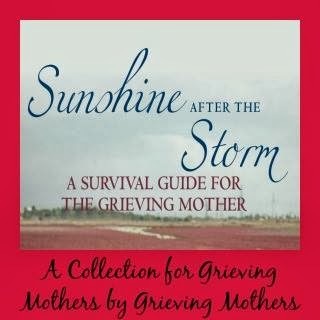 Stay tuned if you need some more positivity in your life while traveling this journey of pregnancy after loss. “Oh. 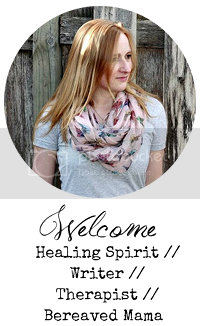 Okay.” She responded and then went on to reassure me and explain that my random, irregular, tightening of my belly from time to time sounded like Braxton Hicks, NOT contractions, all a normal part of pregnancy at 29 weeks pregnant. She also said if I had four or more in an hour with increase in pain I needed to go get checked out. My mind was at ease for a day. So I called back and this time my favorite nurse in the whole world (I just love how supportive my OB nurse is) realized that my anxiety was getting the best of me and recommended that I come in on Friday to ease my nerves. I did and we did an NST (none-stress-test), checked my cervix, and baby No. 2, and my body passed with flying colors. This time the doctor was trying to reassure me that my body was just doing what it is supposed to with Braxton Hicks and that everything was checking out as normal. I felt better for a few hours. And then I remembered why I was doing all this second guessing of doctors, nurses, myself, and especially my body. The answer I remembered was because I didn’t trust in my body like I did last time I was pregnant. I no longer believed that she would keep my baby safe and I miss that. My mind misses feeling calm and connected to the infinite wisdom that is within my body to produce life. My body and mind are in constant battle with one another arguing about what each thinks is right for this baby. I decided I can’t have that anymore. I WANT to place some trust back into my body again and I think she deserves that. Will my mind give her free rein to be solely in charge of the rest of this pregnancy? No. But I will give my body some trust back and I have been doing so with the use of positive affirmations. I find them helpful when I’m in moments of panic or just lost in thought. I will warn you, they are kind of cheesy (because that is just who I am), but if you need to I encourage you to use some of mine or make up your own. It might help you calm your mind and ease your nerves about any part of pregnancy you might be anxious about. I am strong, healthy, and so is the baby I am creating. I possess the strength and courage it takes to bring this baby into the world healthy and alive. 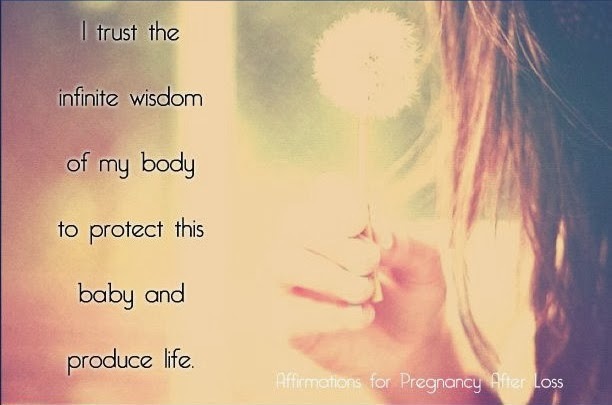 I trust the infinite wisdom of my body to protect this baby and produce life. My fears about past pregnancies and the future of this pregnancy are melting with each moment. Birth is safe for me and my baby; it’s a natural part of creation. My pregnant body is a beautiful vessel that is blooming and creating life. I visualize a beautiful birth and coming home with a healthy baby in my arms. This baby growing inside me is full of life and will live a beautiful one. I breathe in strength and breathe out calm and confidence in my body and baby. My baby loves me and I love my baby, that is enough. 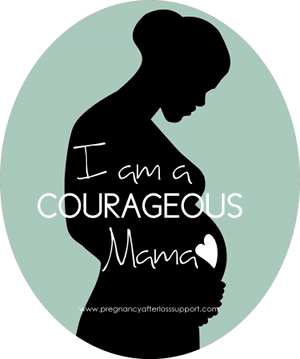 What affirmation do you say to yourself during pregnancy? This is a powerful affirmation our bodies are amazing. Wishing you all the very best for the coming weeks. thank you for your positive post.